The WISMEC SINUOUS FJ200 TC MOD comes with a build-in 4600mAh battery, and the max output wattage is 200W. The screen is 1.3-inch OLED screen and the 510 connector for tanks up to 28mm diameter. The SINUOUS FJ200 supports VW/TC(Ni/Ti/SS)/TCR modes. Available in Black, Blue, Bronze and Red colors. 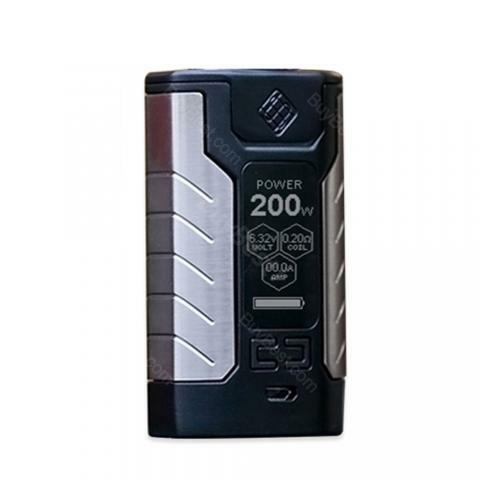 The WISMEC SINUOUS FJ200 TC MOD comes with a build-in 4600mAh battery, and the max output wattage is 200W. The 1.3-inch OLED screen is big enough for clear data and easy to operate. The FJ200 Mod is spring-loaded 510 thread, and the 510 connector for tanks up to 28mm diameter. The SINUOUS FJ200 mod supports VW/TC(Ni/Ti/SS)/TCR modes and the hidden fire button and responsible indicator light makes the mod is beautiful and amazing. Available in Black, Blue, Bronze and Red colors. Die Cigma ist smart, schön schlank und gut im Handling. WISMEC ist recht handlich - sie wirkt sehr gut verarbeitete. It's my second mod and it is wonderful. I'm happy with the price and quality.